1) This was a nomination. When are the winners announced? “It’s an honor to be nominated” & “I’m just happy to make the Team” are believable until the awards ceremony/competition. Then, I want to be up on the dais/in front of the victory gallop. Not making nice-nice noises with the also-rans. 2) Each nominee is supposed to nominate 15 addition blogs. The backtrail from here goes: Rodney’s Saga nominated by Writing From the Right Side of the Stall nominated by la Vida loca nominated by Crazy-Train to Tinky Town, at which point the path bifurcates as Crazy Train was nominated by several folks. That makes 5 generations, at least, which tops 50,000 blogs. (1st gen =1, 2nd gen = 15. 3rd gen = 225. 4th gen = 3,375. 5th gen = 50,625. Unless the originator is the 0th generation, which means 5th gen = 759,375.) So the question is, at what point do the number of nominations exceed the number of people on the planet? 3) What is it? I can’t Google a website nor an explanation of the award. Not even a Wikipedia entry, which I didn’t think was possible. 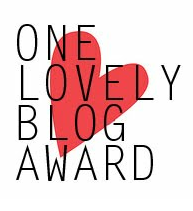 1) I must thank & link back to the nominating blog, Writing From the Right Side of the Stall, which I do most heartily, despite the ungracious things I say herein. She’ll understand. She might even be proud. One of the things I admire about WFtRSotS is that she lets out the snark which I am too much of a pansy to express in print. 2) I must give 7 Surprising Things About Myself. Nope. I am not a person of hidden depths. High-maintenance, moody, difficult – sure. Subtle, complicated, abounding in subtext – no. Meet me for an hour, or read my back posts, and you will know all there is to know: I read science fiction [Barn Books], I play with LEGO [BrickFair: day 2], I like animals [entire archive], etc… No one has ever said to me, “You’ve been quiet over there. Tell us what you’re thinking.” This outlook has advantages. Passive aggressive tactics get no traction. If a person says, “Let’s do X.” while meaning, “If you loved me, you would do Y.” I simply wag my tail like a big, happy dog and go forth to do X. 3) I must in turn nominate other blogs. The horse blogs I have found are listed on my blogroll, 32 & growing. Nominating half of them seems as selective as the 68-team playoff in NCAA basketball. A little exclusivity folks? Blithe Traveler. Also nominated by WFtRSotS, for recounting a life “which makes me very, very jealous (except when it comes to icky forest leeches).” The term you are looking for is support system, not mutual admiration society. I enjoyed her (BT not WFetc.) two $700 Pony books. When I went to China, I emailed her for advice. We stayed in touch. 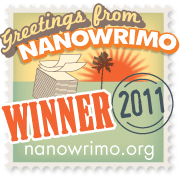 Did NaNoWriMo together, sharing daily word counts, encouragement, and crises. I read her blog. I’ve watch her children grow up in photographs. I retell her stories to Hubby. I tell her way TMI, I’m sure. I count her as a close friend. Yet, the one thing I keep forgetting about her is that we have never met. Is this virtual living a boon or creepy? Am I fashion forward or do I need to find three-dimensional friends? into mind. A schizophrenic combination of Beautiful People make-up/jewelery/fashion and psychological insight of such depth that you can’t believe it comes from a 20-something [What]. My Body The City: The Secret Life of a Callgirl. This is the Internet. It could be true. It could be electronic codswallop. Either way, it’s a powerful account. If you’ve ever wondered why women don’t just leave such a life, she’ll convince you. None of these mentions constitute a formal nomination. BT was just nominated, into mind and My Body are too popular to need my help, So the insanity stops here. Although, I reserve the right to change my mind. What is your favorite non-horse blog? Never read another blog. This is stupid, but, where do you find them? The first two (Wf..& BT) I knew pre-blog. The other 2 were kind enough to comment or like a post so I checked them out in return. Probably my favorite non-horse blog is http://www.fatcyclist.com. I don’t read every word, every day, but I find the biking and running and general joie de vivre of the site inspirational. In a “put down that Sachertorte!” kind of way. I also read http://www.yarnharlot.com. You do have to be a bit of a yarnie to find that one interesting, but I *love* her writing style.